The 700 Series Provides A Wide Range Of Utility For Handling Oxygen, Acetylene, Nitrogen, Helium, Argon And Other Gas Cylinders. * Base Plates Are Designed For Hauling Boxes When Needed. *Handles Medium And Large Cylinders. *See Wheel Section - 5/8'' Bore For Other 10'' Wheel Options. 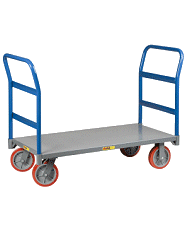 these hand trucks are perfect to move propane tanks around. the quality is amazing, put together very well.